The question of tolerance and Islam is not a new one. Polemicists are certain that Islam is not a tolerant religion. As evidence they point to the rules governing the treatment of non-Muslim permanent residents in Muslim lands, namely the dhimmi rules that are at the center of this study. These rules, when read in isolation, are certainly discriminatory in nature. They legitimate discriminatory treatment on grounds of what could be said to be religious faithand religious difference. The dhimmi rules are often invoked as proof-positive of the inherent intolerance of the Islamic faith (and thereby of any believing Muslim) toward the non-Muslim. This book addresses the problem of the concept of 'tolerance' for understanding the significance of the dhimmi rules that governed and regulated non-Muslim permanent residents in Islamic lands. In doing so, it suggests that the Islamic legal treatment of non-Muslims is symptomatic of the more general challenge of governing a diverse polity. 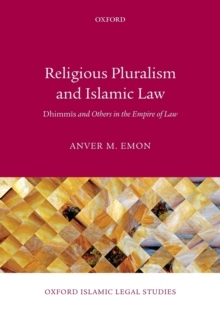 Far from being constitutive of an Islamic ethos, the dhimmi rules raise important thematic questions about Rule of Law, governance, andhow the pursuit of pluralism through the institutions of law and governance is a messy business. As argued throughout this book, an inescapable, and all-too-often painful, bottom line in the pursuit of pluralism is that it requires impositions and limitations on freedoms that are considered central and fundamental to an individual's well-being, but which must be limited for some people in some circumstances for reasons extending well beyond the claims of a given individual. A comparison to recent cases from the United States, United Kingdom, and the European Court of Human Rights revealsthat however different and distant premodern Islamic and modern democratic societies may be in terms of time, space, and values, legal systems face similar challenges when governing a populace in which minority and majority groups diverge on the meaning and implication of values deemed fundamental toa particular polity.